[18.3.32] Show mini-statement on invoices instead of "Amount credited"
In previous versions, when you issued an invoice (or received an invoice from supplier) which was eventually paid in full or partially, Manager would show on invoice mysterious total named Amount credited just before Balance due. It was even worse when you have entered invoice for customer if their account was in credit. The credit would be automatically applied to new invoice shown under Amount credited total. 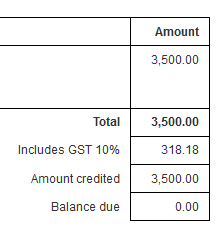 Amount credited was simply total of all transactions associated with the invoice but I came to realize it was too disconnected from what one would expect. Not to mention often Amount credited would represent single transaction (typically the payment for invoice). The latest version no longer shows Amount credited and instead of it it simply enumerates list of transactions associated with the invoice so it’s easier to see how did Manager come up with Balance due figure (if it’s different from invoice total). Possible bug in implementation of "mini-statements"
@lubos there seems to be a bug. version 18.3.45.
the mini statement on invoice does not show the correct date of receipt. please note this only happens when the payment is entered in advance before actually creating an invoice. for example, if a payment was received in advance on 10th March and the invoice created on 20th March, the receipt date on invoice automatically substitutes to the invoice date, in this case 20th March. the reference number is correct. That is not a bug. That is the date the receipt was credited against the invoice. The same thing happens when a starting balance is credited. then i would suggest to not show the date at all. it is just misleading. the receipt reference number and its date are supposed to be a single data. That is not a bug. That is the date the receipt was credited against the invoice. i am sorry but this would make no sense. it is understandable without mentioning that an advance payment is applied to the invoice on the date the invoice is created. so why unnecessarily show the same date again. Because there may be several payments credited, some from advance payments, some from starting balances, some from partial payments after the invoice date, some from final payments. and that is exactly what i am asking to be shown. the actual date the payment was received and not the date the payment was applied. in a scenario where the customer had paid advance payment in five installments, the customer when checking the mini statement shown on the invoice would want to see which payment transactions made on what date had contributed to the balance due. they would not want to see the date of the invoice printed again. 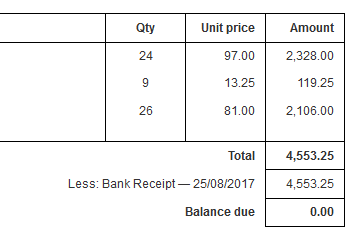 costumer old remaining balance showed on new invoice, is it possible. It already does show for the invoice. If you want other status, send a statement. How can I remove this from the printed invoice? what you are asking is not possible. you can create a custom theme to show or hide anything on the document. please hire a local programmer if you are not familiar with coding. I use a custom theme, where I removed the last “balance” statement. But I don’t know how to do the same thing with the new one. And I would like to mention that this kind of updates, when created, should be optional for the users and not change the total layout of the company’s formal documents. Otherwise, you should advise us with the alternative solution to remove it and not send us to a local programmer.